As our own country sinks into the dark times of a putrid fascism, it is all the more of a loss to us that comrade Fidel Castro has died. Beyond the borders of our truth-deprived empire and the filthy lies of the bourgeois press, the world's people mourn the loss of a great man. 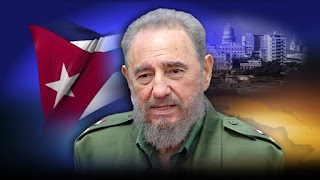 Fidel Castro may prove to have been the best leader of any country in history over his long lifetime and as important to the ongoing struggles for socialism as Lenin or Marx. Comrade Fidel brought economic justice, education, world class medical care for all and independence to Cuba. He developed and expanded a humane civilization and system which has become increasingly democratic. He showed by example that the other nations in our hemisphere and around the world need not be colonies exploited by wealthy nations like the US. His example and his creation of the non-aligned movement continues to be influential. Cuba, under his leadership stood with and defended oppressed countries. Cuba continues to train and exports doctors. Fidel and Cuba have been and will continue to be a shining example and a force for civilization in an increasingly dehumanized and brutal world. "There is chaos in our world, both within the country's borders and beyond. Blind laws are offered like divine norms that would bring peace, order, well being and the security our planet so badly needs. That is what they would have us believe. Three dozen wealthy and developed nations that monopolize the economic, political and technological power have joined us in this gathering to offer more of the same recipes that have only served to make us poorer, more exploited and more dependent. There is not even discussion about a radical reform of this old institution formed over half a century ago when there were few independent nations - to turn it into a truly representative body of the interests of all the peoples on Earth. An institution where no one would have the irritating and anti-democratic right of veto and where a transparent process could be undertaken to expand membership and representation in the Security Council, an executive body subordinated to the General Assembly, which should be the one making the decisions on such crucial issues as intervention and the use of force. It should be clearly stated that the principle of sovereignty cannot be sacrificed to an abusive and unfair order that a hegemonic superpower uses, together with its own might and strength, to try and decide everything by itself. That Cuba can never accept. The poverty and underdevelopment prevailing in most nations as well as the inequality in the distribution of wealth and knowledge in the world are basically at the source of the present conflicts. It cannot be overlooked that the current underdevelopment and poverty have resulted from conquest, colonization, slavery and plundering in most countries of the planet by the colonial powers and from the emergence of imperialism and the bloody wars motivated by new distributions of the world. Today, it is their moral obligation to compensate our nations for damages caused throughout centuries. Humanity should be aware of what we have been so far and what we cannot continue to be. Presently, our species has enough accumulated knowledge, ethical values and scientific resources to move towards a new historical era of true justice and humanism. There is nothing in the existing economic and political order that can serve the interests of humankind. Thus, it is unsustainable and it must be changed. Suffice it to say that the world population is already at six billion, 80% of which live in poverty. Ages old diseases from Third World nations, such as malaria, tuberculosis and others equally lethal, have not been eradicated while new epidemics like AIDS threaten to exterminate the population of entire nations. Nature is being devastated. The climate is changing under our own eyes and drinking water is increasingly contaminated or scarce. The sources of man’s seafood are being depleted and crucial non-renewable resources are wasted in luxury and triviality. Anyone understands that the United Nations basic role in the pressing new century is to save the world not only from war but also from underdevelopment, hunger, diseases, poverty and the destruction of the natural resources indispensable to human life and it should do so promptly before it’s too late! The dream of having truly fair and sensible rules to guide human destiny seems impossible to many. However, we are convinced that the struggle for the impossible should be the motto of this institution that brings us together today."